I grew up reading Tiger and Roy of the Rovers so when I noticed Susy mucking about with Stripgenerator I couldn't resist having a go. 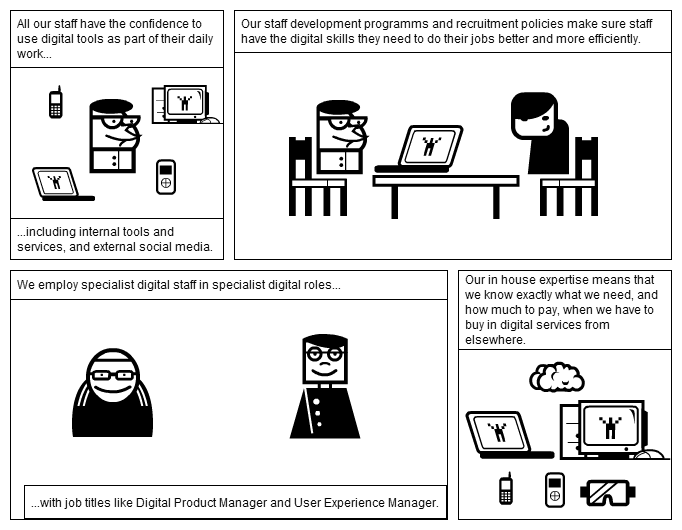 And then when I needed a slide to explain the work we're doing to develop digital capability in the department, a comic strip seemed a better bet than a set of bullet points. I'm not sure if I've quite nailed the medium yet with my sub clip-art sketches, but I'm enjoying trying. Susy's a more advanced comicstrip artist than I am, as you can see in her social media advice strip. It's harder than you might imagine to distill a digital strategy outcome into a caption, a picture and a thought bubble, but it might be worth the effort. Finding different ways to present this stuff might just help us to interest more of our colleagues in what we're doing. As ever, leading the way with innovative ideas - thanks for sharing this Stephen.